Since 1990, the Monterey Peninsula Water Management District (District) has carried out a Vegetation Management Program in the channel of the Carmel River to reduce the potential for bank erosion and to remove deleterious material. 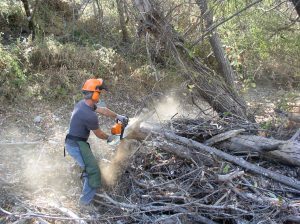 Activities under this program include the removal or modification of problematic vegetation by hand with chainsaws. This program was designed to complement the overall management and restoration of the Carmel River by trying to limit instability in stream reaches that had been impacted by water extraction. Carrying out vegetation management activities is a permit intensive process and must take into account the listing of the California red-legged frog (Rana aurora draytonii) in 1996 and steelhead (Oncorhynchus mykiss) in 1997 as threatened under the Federal Endangered Species Act (ESA). Because riparian vegetation on the banks of the Carmel River protects property from the erosive forces of water and the dependence of wildlife on riparian vegetation for cover, great care is taken to only modify vegetation in the most constrained reaches. Currently the Vegetation Management Program focuses on problematic areas that experience blockages from in-channel vegetation growth, encroachment (from the river bank), or downed trees. However, it is important to note that the District is not a flood control agency, and any work that helps reduce flooding is purely incidental. The District inspects 15.5 miles of the Carmel River (Camp Steffani to the Carmel River Lagoon) every spring for potential problem areas. When selecting vegetation management areas the first consideration given to each site is where it falls in the landscape. The decision to trim, modify or remove riparian vegetation (cut at the base) is based on current open channel width, the proximity of houses, bridges, stream gages, other infrastructure, susceptible streambanks, and natural constrictions in downstream reaches. Once problem areas are identified, habitat assessments for juvenile steelhead, California red-legged frog, and riparian vegetation are carried out. This information is then compiled into a project description and then sent out to all the regulatory agencies by April 15th of each year. It is important to note that MPWMD does not modify vegetation in river reaches that have the ability to absorb change such as parts of Garland Park and other areas that are not in the vicinity of houses roads or other infrastructure. Vegetation Management work typically occurs in September and October of each year. However, large trees can fall into the active channel any time of year and may require modification between high flow events. The Carmel River will always transport woody debris to the Pacific Ocean. Therefore, the highest priority is given to debris and vegetation management near bridges that are the sole access for residents and emergency personnel. It is the goal of the District to protect human life and property while at the same time balancing management actions with preservation of habitat and water quality. Contact: Thomas@mpwmd.net.